Kathryn Purcell is a Research Wildlife Biologist and Team Leader with the USDA Forest Service, Pacific Southwest Research Station. She has studied birds from low-elevation foothill oak woodlands to high elevation conifer forests in California’s Sierra Nevada. 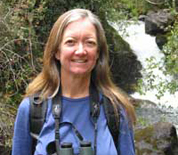 Her research interests include life histories of open- and cavity-nesting birds, habitat and nest-site selection, source-sink dynamics, responses of birds to habitat alteration, and invasive species. She also has an interest in the design of monitoring programs for detecting population trends and response to habitat change. In addition, she is the lead scientist for the Kings River Fisher Project in the southern Sierra Nevada.